Listen! You will become pregnant and give birth to a son, and you are to name him Jesus. And behold, thou will conceive in thy womb, and bring forth a son. 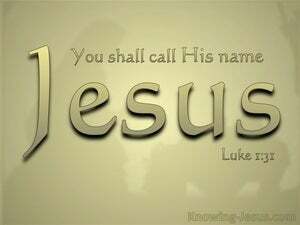 And thou shall call his name JESUS. And behold, thou shalt conceive in thy womb, and bring forth a son, and shalt call his name JESUS. And consider this, you will become pregnant and give birth to a son and you will name Him Jesus. And behold, you shall conceive and bear a son, and you shall call his name Jesus. you shall be now pregnant, and be delivered of a son, whom you shall name JESUS. And behold, thou shalt conceive and hear a son, and thou shalt call His name Jesus. You are to become a mother and you will give birth to a son, and you are to name him Jesus. And, behold, thou shalt conceive in thy womb and bring forth a son and shalt call his name Jesus. And, behold, thou shalt conceive in the womb, and shalt bear a son, and thou shalt call his name JESUS. And, behold, you shall conceive in your womb, and bring forth a son, and shall call his name JESUS. And behold, you will conceive in the womb and will give birth to a son, and you will call his name Jesus. And behold! You shall conceive in your womb and bear a son, and you shall call His name JESUS. Lo: thou shalt conceive in thy womb, and shalt bear a son, and shalt call his name Jesus. 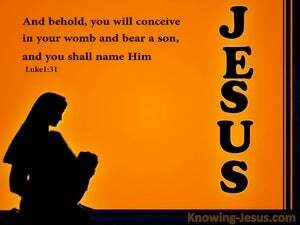 You are to conceive and bear a son, and you must call his name Jesus. "And behold, you shall conceive in your womb and bear a son; and you shall call his name Jesus. Listen: You will become pregnant and give birth to a son, and you will name him Jesus. And lo! thou shalt conceive in thy womb, and hear a son, and shalt call his name Jesus. And behold you shall be with child, and bear a son, and shall call his name Jesus. And, behold, thou shalt conceive in thy womb, and bring forth a son, and thou shalt call his name JESUS. And now, you shall be with child and give birth to a son, and you shall give him the name Jesus. You will conceive in your womb and bear a son; and you are to call His name JESUS. Listen! You will become pregnant and bear a son, and you must name Him Jesus. And, behold, you shall conceive in your womb, and shall bring forth a Son, and you shall call His name Jesus. to a virgin, betrothed to a man, whose name is Joseph, of the house of David, and the name of the virgin is Mary.